It's one of the ultimate images of summer: a woman in a short, pink slip sits on a bed, her knees pulled up to her chest, gazing out a window. Her hair is tucked back into a bun. Her bare arms rest lightly on her bare legs. Edward Hopper painted her in 1952 for a work called Morning Sun. The picture has been widely reproduced for decades. But on a recent visit to its home at the Columbus Museum of Art in Columbus, Ohio, it was nowhere to be found. "It's on loan right now to an exhibition," explains Melissa Wolfe, the museum's curator of American art. "It travels a lot. It's a very well-requested painting." The museum sometimes turns requests down — the lady needs to rest, after all — but Morning Sun still has a very impressive passport. "She's been to Japan twice. She's been to Mexico twice," Wolfe says. "She was at the Tate Modern [in London]. She's been to Italy, Switzerland, Germany." Right now, she's in Madrid; this fall, she goes to Paris. When she's gone, the museum keeps a big poster of her in the gallery where the painting usually — or really just sometimes — hangs. It's slight comfort for fans seeking to see Hopper's lady in the flesh. As some consolation, there are some fun facts to be learned about how she travels. Museum Director Nannette Maciejunes says the museum does all the packing; they use bubble wrap, sealing tape and a crate. "The Hopper has its own special crate," Maciejunes says. "We've had it remade a couple of times, but we just keep it. It's marked 'The Hopper Crate' and we store it for the next time she goes on a trip." Museum staffers travel with her. Before airport super-security became a way of life, curators could stand on the tarmac and watch paintings being loaded; now, they go to a viewing room to watch. Accredited museums don't charge when they lend — collegial creed, they say — but there is a small fee to cover paperwork. As for insurance, it's paid by the borrower. "And it's wall to wall," Wolfe says. "They insure it from the time it comes off our wall to the time it comes back to our wall." Before Morning Sun goes up on a new wall, it sits in its crate, usually for 24 hours, getting acclimatized, kind of like a fine violin. Then, Columbus staffers monitor the uncrating and inspect to make sure it's traveled well. "We watch it go up on the wall," Wolfe says. "And then we say, 'It looks great, good luck,' and we head home." Columbus became home to Morning Sun thanks to an acquisitions fund donated by a wealthy local collector and painter. In 1954, the museum was looking to add a Hopper to its collection, so they got in touch with Frank K.M. Rehn at Hopper's New York gallery. "Rehn said, 'Well, if you offer us this much, I'm sure Eddie will take it.' And he did," Wolfe says. "It was $3,500." Maciejunes says it's a historic value. "That's one of the things in the museum business you really don't talk about — current values of paintings," she says. "It's kind of hard to believe that an Edward Hopper in 1954 [was] $3,500." In recent years, Hoppers have gone for $10-plus million and $20-plus million — enough to buy a few mink coats to cover that bare-armed lady in the picture. She was someone Hopper knew very well. "The model was Jo, [who was] Hopper's wife," Wolfe says. "She insisted after they were married in the '20s that she be his only model." 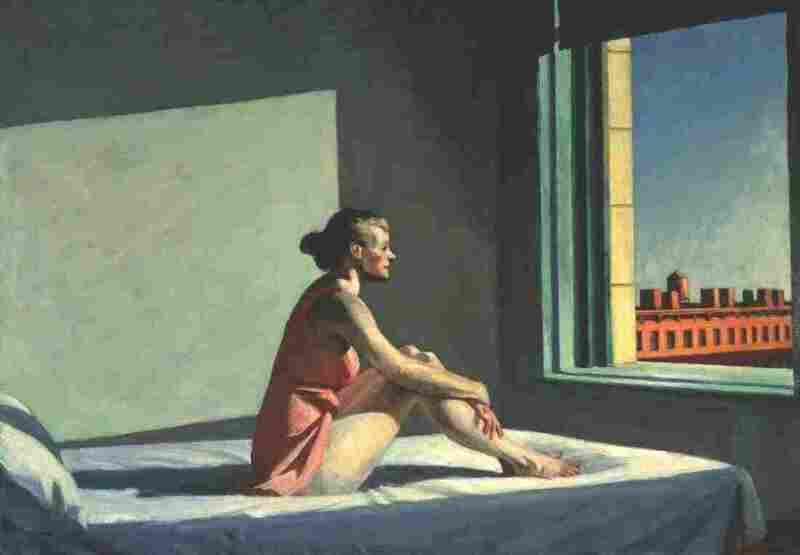 She was 69 when she posed for Morning Sun, yet Hopper paints a shapely woman — no wrinkles, no wriggly chin. (It must have been nice to have a husband who kept you young.) She's thoughtful as she looks out that painted window at buildings across the way. Wolfe says, "When I look at this for a long time, I always imagine that ... the implication is that there is someone just like her sitting sort of in this atomized, bare room, looking out of every single one of those other windows, too." Maybe Morning Sun is about isolation in cities, everyone in her or his own world. People always think Hopper — a solitary, quiet man — is painting loneliness. But not Wolfe. She says, "Hopper himself said the loneliness thing is overrated." The way she sees it, Morning Sun is about solitude, not loneliness.